Blush Clinics and Dr. Jamuna Pai always known to be pioneers in the skincare field have introduced the PRP Autologous Skin Rejuvenation, a treatment that restores natural beauty, naturally. PRP stands for Platelet Rich Plasma, which is a concentration of platelets derived from your own blood (Autologous) to trigger a healing process. Platelets contain packets of growth hormones and cytokines that tell the tissues to increase rebuilding of tissues to enhance healing. When PRP is injected into the damaged area, it stimulates a mild inflammatory response, which triggers the healing cascade. This leads to restored blood flow, new cell growth, and tissue regeneration. Because the blood is your own, there is no risk of rejection, infection as it is totally bio-compatible and bio-degradable. A sample of blood will be taken from a vein in your arm under sterile conditions. The blood will be placed in a centrifuge, which is a device that spins the blood. This helps to separate the blood cells from plasma, and allows concentration of the platelets. This process increases the concentration of platelets, which have the healing growth factors. The preparation takes about 15 minutes. The finished PRP product is then available for injection into the skin where skin rejuvenation and regeneration is required. What indications can it treat? PRP Skin rejuvenation treatment utilizes the potential of your own body to improve the overall texture and tone of your skin, naturally. It reduces wrinkles and blemishes such as acne scars and may be used as part of your health and beauty regimes to improve the overall condition of the skin, improving tone and texture. 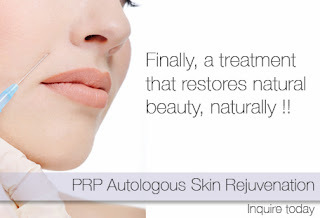 It is a natural approach to improving the condition of your skin, and you are using your own unique tissue growth factors and healing properties to revitalise the skin by improving blood supply and stimulating collagen formation, the results of which improves and increases over time with evidence suggesting that the results of PRP Skin Rejuvenation Therapy lasts longer than chemical treatments. The treatment is conducted by registered medical practitioners under strict hygienic conditions. Also the accessories (vaccutainers containing growth factors in which the withdrawn blood is placed for centrifugation) are imported from Switzerland to ensure safety and superior quality. If you have undergone a blood test you will know the pain is negligible. Also the site of treatment where healing and rejuvenation is required is treated with a numbing gel so all that you feel are just tiny pin pricks. PRP Skin Rejuvenation is specifically designed for you, by you! Is PRP Therapy safe to undergo? Thanks for posting information about the treatment available for anti-ageing. Skin Rejuvenating process is done by some of the best skin clinics in Bangalore. To find out more about Laser Skin Resurfacing Treatments Delhi and other forms of acne scar treatment in Delhi visit our website.